You took one resolution : to take care of yourself and eat nutritious and healthy foods ? You should know that it is very important to have a nutritious and healthy breakfast. The recipe we suggest you today is a recipe that will become your new favorite breakfast. 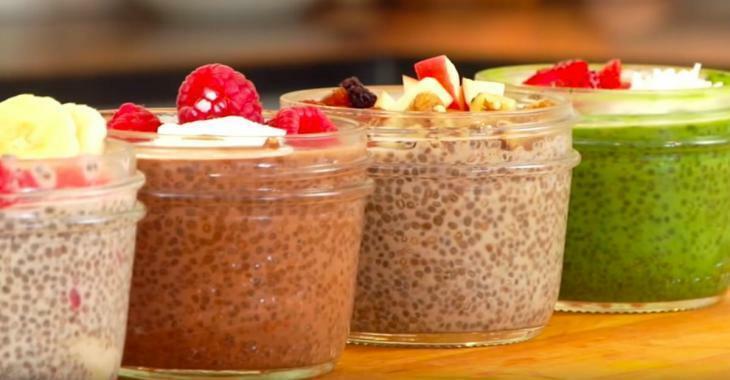 Do you know chia seeds ? They come from a plant and are full of nutrients essential for health, such as omega-3s, fiber, protein, antioxidants and they also contain calcium. These seeds are delicious in a pudding. It can be prepared in advance and you can eat it for breakfast, since it is very nutritious. But it can also be enjoyed as a snack and as a dessert. It's up to you ! - Mix all the ingredients in a Mason jar. - Refrigerate for at least 4 hours. - Garnish with your favorite ingredients. - You can keep the pudding in the refrigerator for 5 days. The 4 alternatives offered are delicious. You can watch all the steps necessary to make this delicious breakfast that will please you and your whole family. Enjoy ! Do you like our simple and delicious recipes ? Do not wait any longer and subscribe to our Pinterest account to discover our delicious recipes and to be able to easily save them on your personal boards.